Bethel Church has been around since 1855. Three years after its founding, the sanctuary that Cari & Steve were married in was built from trees growing on the site. Another cool feature: the ministers are a husband and wife team -- how great is that! It was a beautiful day with the most gorgeous of skies -- Simpsons clouds I'm telling you! And Steve's family -- oh how fun! said & did that the day. (at least in my camera) ~ there are lots of great images to soak up. HERE'S A LINK TO A FEW OF THE DAY'S HIGHLIGHTS. ~ Jennifer, what a great job you did second-shooting this wedding. One of my favorites of your creations is found below. Great moment; great seeing. Kim and I love working with you, Jennifer!! 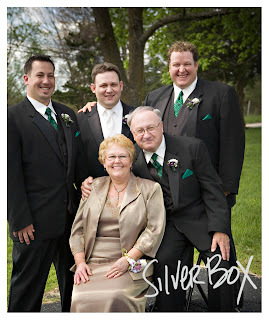 Thanks for all you did Saturday and all you do for SilverBox. Congrats on your new space ~ sure seems to suit you perfecty. You were so blazingly quick in creating that perfect ring of braid in little Emma's silky "baby hair". It held all day! Not only did you figure out the perfect style within seconds; you had it braided & pinned within -- get this: (my cameras encode time) ONE MINUTE and FORTY-SEVEN SECONDS, start to finish. Whew -- that was a site to see!!! Cari & Steve, what a day! 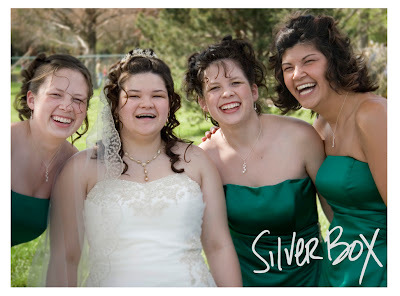 Thanks so much for the opportunity to document your celebration & your fabulous families.